LEXAN® coated sheet is a two sided hard-coated polycarbonate material that offers excellent impact resistance, optical clarity and abrasion resistance. LEXAN coated sheet is ideal for many functional parts requiring exceptional toughness and surface hardness. Weight savings - Using LEXAN® carries a substantial weight savings over the use of ordinary glass. For example, a 1/4" thick square foot of LEXAN® weighs 1.56 lbs. in comparison to 3.2 lbs. of glass. 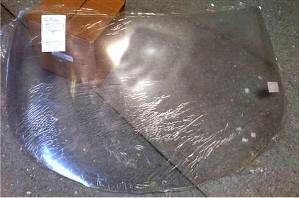 Another consideration is that further weight savings can be obtained because a lesser thickness of LEXAN® may be used. (An 1/8" window may be used replacing a 3/16" thick glass application). Safety considerations support polycarbonate over glass. Glass is a brittle material. LEXAN® has proven to be a much better impact absorbent substance. LEXAN polycarbonate sheet offers the highest impact strength of any transparent glazing product--250 times the impact strength of glass and 30 times that of acrylic. Endorsed by sanctioning bodies - Many sanctioning bodies have endorsed the use of polycarbonate products and more are changing over each season. These authorities have studied and evaluated the suitability of polycarbonates and support their use. Sanctioning bodies permitting the use of polycarbonate windows include NHRA, IHRA, NASCAR, SCCA, ARCA, CART, and many others. Please check with your sanctioning body for updates to the rules for your class or series. 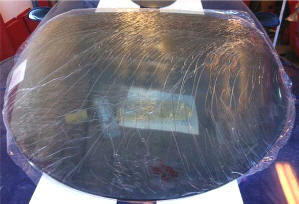 Front Lexan windshield shown with plastic protective cover not yet removed. All windows listed above are "oversize" and require trimming for installation. Rear Lexan window shown with plastic protective cover not yet removed.